Why do saints face towards the left? Arguably, the reason that saints are often portrayed facing towards the left may have a simple explanation: the Occidental practice of reading and writing from left-to-right has acculturated both artist and audience to view the left side of an image as the immediate past and the right side is the impending future. Consequently, saints facing to the left are perceived as contemplating the past whereas saints that face the right are perceived as anticipating the future. Such a perception also applies to unsaintly folk in that figures can be portrayed as thoughtful if they face to the left and may project an attitude of indifference if facing the right. 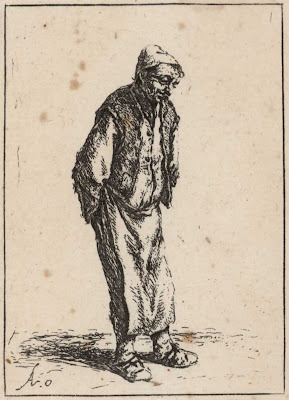 Adriaen van Ostade’s (1610–1685­) etching, Peasant with Hands behind His Back, c.1640, is a fine example of how such perceptions can arise. Condition: Printed on laid paper with slight foxing on the left of the image and light tanning marks from previous mounting (outside of the plate area). Otherwise the print is in good condition. There is a faint pencil inscription (“#7522”) on verso. I am selling this print for $130 AUD including postage and handling to anywhere in the world. Please contact me using the email link at the top of the page if you are interested or click the “Buy Now” button. 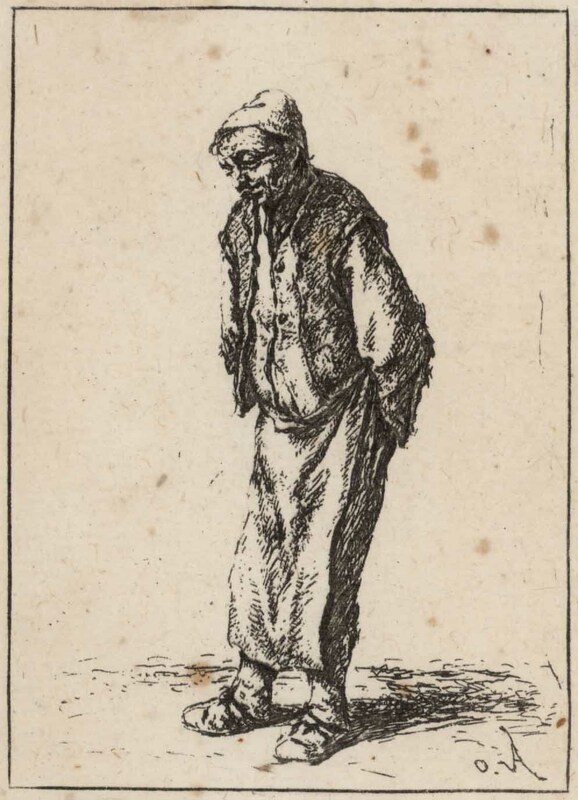 In Ostade’s print, an aproned figure of man is shown divorced from his surroundings that would otherwise have provided a context to visually explain his slightly bowed stance and trace of a smile. For instance, a context appropriate for his clothes and body language could be a tavern scene in which he is cast as an amiable tavern attendant listening to an order. Alternatively, the context may place him as a butcher, or from some other occupation requiring an apron, engaged in conversation or bemused in a state of reverie. 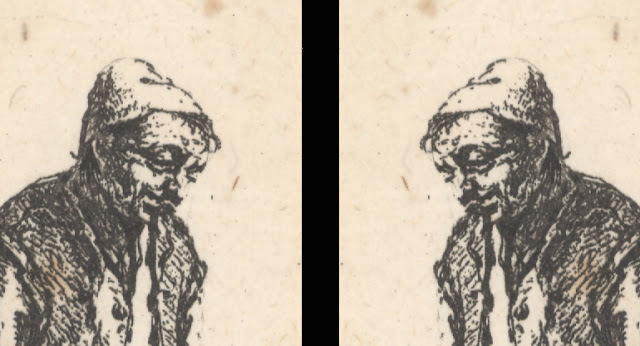 Whichever is the context that Ostade envisaged a viewer’s reading of the fellow’s disposition changes as the image is flipped from its original direction (shown above) to a mirror image view (shown below). From my standpoint, the mirrored image—the way that Ostade drew the figure upon the etching plate—gives the character a fresh layer of intelligence when compared to the figure facing to the right as shown in the print. To my eyes, the mirrored image suggests the man is engaged in looking at, or dealing with, something specific. Going further, the viewer literally reads into his face following the light direction cast from the top-front-left and looks at the figure as if he is facing the viewer. By contrast, the character in the original print appears more abstracted in thought and disengaged from reality. In the print the light no longer emanates from the viewer’s left-to-right reading direction but comes from an unknown source on the right. Such a lighting direction, as all movie buffs know, is the direction that characters move towards when exiting to unknown fate at the end of a movie. No doubt the affect that the direction a subject faces in connoting saintliness or the mindset of ordinary folk rests with each viewer’s personal reading of meaning. While this reality is clearly true, a viewer's reading may be molded by other visual devices working in tandem with a subject's orientation and the Western convention of lighting a subject from the top-front-left. For instance, when looking at the mirrored image of the peasant, I wish to draw attention to the ease with which a viewer can read “into” the figure by virtue of the broken treatment of the figure’s left silhouette edge (see detail below on the left). Moreover, the reading is constrained by the uninterrupted and enclosing outline of the figure's shadow side (see detail on the right). 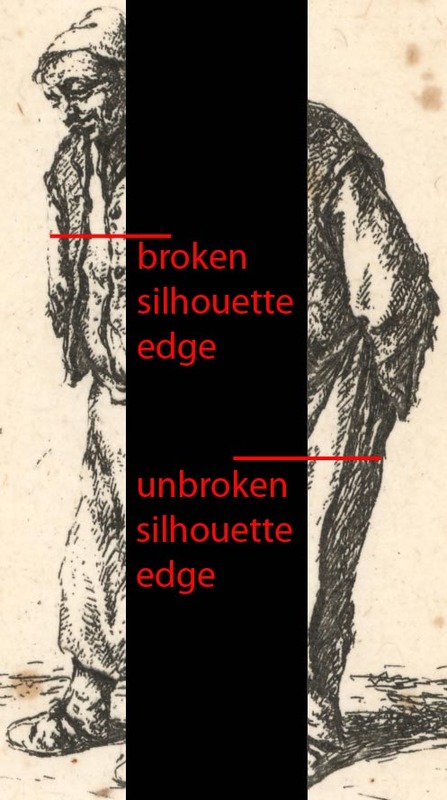 This flow and hesitation in the articulation of viewer's reading arising from the two treatments of line in the figure's silhouette edge is important. One only has to compare the mirrored image with the original image to determine which figure appears more saintly.